In this accessible guide to plant-based cooking, Carol J. Adams and Virginia Messina connect our food choices to social and political movements, outlining practical ways we can make incremental—and delicious!—changes to our diets to affect positive change. 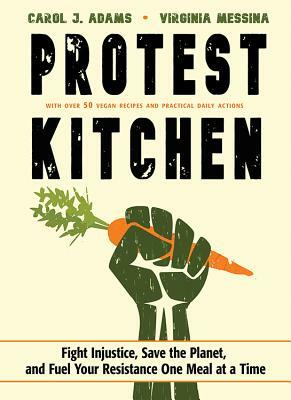 Part cookbook, part manifesto, Protest Kitchen is our essential blueprint for the vegan revolution. Resistance has never tasted so good! I'm a big fan of Kiese Laymon's, ever since coming across an op-ed he wrote on his experience as a black professor at Vassar. He has a way with language and an honesty at once both self-deprecating AND hopeful. This book hit me hard and it hit me good. I also highly recommend his collection of essays How to Slowly Kill Yourself and Others in America. On Harry Potter Book Night: Hogwarts School of Witchcraft & Wizardry, we’ll be sharing the wonder of J.K. Rowling’s unforgettable stories and introducing the next generation of readers to the unparalleled magic of Harry Potter. Here at Phoenix, young wizards, witches and Muggles will be treated to an evening of magical games, activities, readings and quizzes. All ages are welcome to this free event. Costumes encouraged. Join Lori MacLaughlin - author of Lady, Thy Name Is Trouble and Trouble By Any Other Name - for a talk on her new fantasy novel, The Road Once Taken. I am SUCH a fan of Martha Wells' Murderbot Diaries. From the very first one, they have been perfectly paced, and I find it so easy to identify with the sardonic humor of Murderbot. This is the book I want to put in the hands of anyone who says "oh I don't read sci-fi." It's got mystery, adventure, and an AI that just wants to be left alone with it's favorite serial media. Each volume is just the right length to pick up for a day or two, and Wells does a great job of world-building without drowning out the personalities of her characters. Entertainer and teacher Saragail Benjamin weaves story, rhythm, & song in a 100% interactive program. We’ll drum a story, sing a sunrise, and dance to the rhythms of our hearts! Join us for a blast of musical fun! Join us for a story time - and for some coloring activities!